[Weekender] Why do Korean taxi drivers oppose carpooling? In tech-savvy South Korea, ride-sharing and ride-hailing mobile apps are an untouched market due to vehement protest from some 300,000 taxi drivers, who claim new technologies will ultimately wipe out the taxi industry, an industry insider said Thursday. “First, it is illegal to operate carpooling services (in Korea). The biggest issue is the high possibility that carpool apps would take over the taxi market. 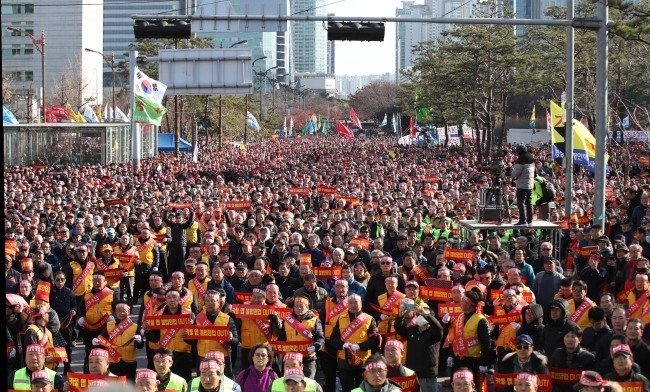 We are fighting to protect our livelihoods because the government is pushing to allow carpool services without a clear explanation,” Lim Seung-woon, policy director at the Korean Automobile & Transport Workers’ Federation, told The Korea Herald. The death of two cab drivers, who set themselves on fire in protest against carpooling services, fueled anger among taxi drivers and led to three massive protests between December last year and last month. As part of efforts to ease tension, a committee, consisting of representatives from the ruling Democratic Party of Korea, the government, the taxi industry and the carpooling market, was launched last month. The main opposition Liberty Korea Party vowed to pass an amendment to limit carpooling business hours, while the ruling party suggested the taxi industry adopt a fixed monthly wage system and rescind daily payments taxi drivers are required to send to companies. Mindful of negative public sentiment toward poor customer service, Lim said taxi drivers are unable to provide satisfactory services due partly to mandatory daily payments. “If we do not pay the daily payment between 130,000 won and 135,000 won, it is deducted from the monthly wage, so some taxi drivers inevitably drive aggressively and offer lower-than-expected service,” Lim said. Meanwhile, to clarify vagueness in Article 81 of the Passenger Transport Service Act, the Liberty Korea Party has suggested a revision that limits operating hours of carpooling services, with the aim of passing the bill at the provisional session of the National Assembly. The amendment stipulates passenger vehicles can be used for commercial purposes between 7a.m. and 9a.m. and 6 p.m. and 8p.m., with the exception of weekends and national holidays. “We will prepare additional measures for taxis and carpool services to coexist. Extensive discussions will be carried out to protect the livelihoods of taxi drivers,” the Liberty Korea Party said. However, taxi labor unions are calling on lawmakers to remove Article 81 of the Passenger Transport Service Act, saying the two deceased cab drivers would have wanted this. Amid the dispute over carpooling, Kakao Mobility, a unit of Korean IT giant Kakao, has delayed the launch of its carpooling service for the time being. Maintaining its stance, the taxi industry is preparing to hold its fourth protest during the provisional session of the National Assembly expected to take place this month.